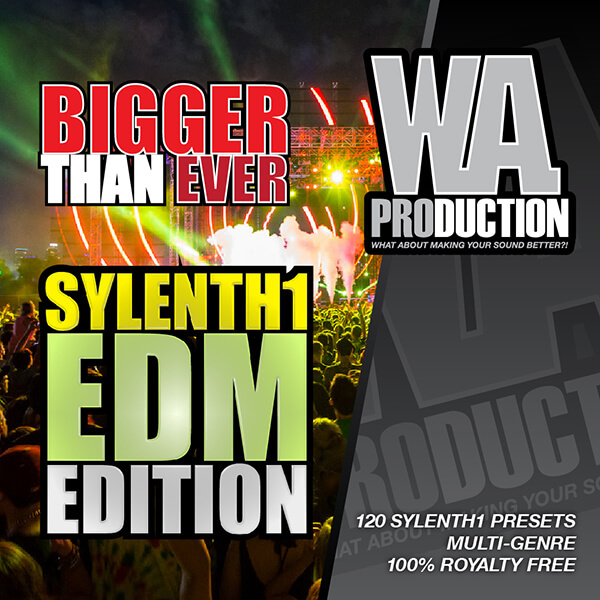 ‘Bigger Than Ever: Sylenth1 EDM Edition‘ from W.A.Production brings you the biggest and the fattest EDM presets that can Sylenth offer. In this amazing soundset, inspired by artists such as Martin Garrix, DVBBS, W&W, Showtek, Ummet Ozcan, Deorro, Dmitri Vegas & Like Mike and many more, you will find 120 top-notch sounds that will fit any modern EDM genre. ‘Bigger Than Ever: Sylenth EDM Edition’ contains only the most amazing sounds, designed to bring a unique and massive feeling to your mixes. Each sound has been crafted with precise attention to detail to allow your breaks and drops to sound more sharper and powerful. Please Note: Sylenth version 2.2 is required for this soundset.